Niman Ranch Filet Mignon Chili, Turmeric Rice, Sunny Side Eggs, Tortilla Strips, Green Onions, Fresno Chilis. Two Sunny Side Eggs, Tortilla Chips, Black Beans, Pico De Gallo, Roasted Poblano & Pepita Sauce, Ricotta Salata. Hand Made Potato Galette, Dill Cream, Fried Capers, Tomato, Micro Greens. Two Poached Eggs, English Muffins, Hollandaise, Fried Capers, House Potatoes, Mixed Greens. Scrambled Eggs, Smoked Applewood Bacon, Crispy Tater Tots, Cheddar Cheese, Pico De Gallo, Roasted Poblano Sauce. Flour Tortilla Shell, Sunny Eggs, Black Beans, Ricotta Salata, Pico De Gallo, Poblano Salsa, Sour Cream, Avocado, Corn Tortillas. Poached Eggs, Ham, Hollandaise, English Muffin, Fingerling Potatoes, Baby Mixed Greens. Sunny Eggs, Red Rice/Quinoa, Chickpeas, Tomatillo, Toast. Tomato, Cucumber, Dill, Whipped Cream Cheese, Capers, Onions, Plain Bagel. Two Farm Eggs Hard Boiled, Avocado Mousse, Pea Sprouts, Cilantro, Red Onions, Fresno Peppers, Ricotta Salata, Black Sea Salt, Crispy Pizza Crust. Baked Eggs, House Made Pork Sausage, Olives, Caramelized Onions, Potatoes, Tomato Sauce, Mozzarella, Focaccia. Scrambled Eggs, Bacon, White Cheddar, Caramelized Onions, Spinach, Mushrooms, Roasted Fingerling Potatoes, Baby Mixed Greens, and Toast. Scrambled Eggs, Hills Farm Ham, White Cheddar, Caramelized Onions, Roasted Red Peppers, Three-Chili Sauce, Tortilla Strips, Roasted Fingerling Potatoes, Baby Mixed Greens and Toast. Mushroom, Asparagus, Swiss Chard, White Cheddar, Roasted Pepita Sauce, Roasted Fingerling Potatoes, Baby Mixed Greens, and Toast. Pork Sausage, Roasted Red Peppers, Fennel Pollen, Mozzarella, Roasted Fingerling Potatoes, Mixed Greens and Toast. Peanut Butter Cream, Sliced Bananas, Raw Cacao, Shredded Coconut. Flour Tortilla, Garlic Hummus, Roasted Peppers, Red Onions, Olive Tapenade, Romaine Lettuce, Feta Cheese, Side of Tabouli. Oven Roasted Filet Of Sole, Light Parmesan Panko Crust, Sauteed Zucchini, Lemon Caper Sauce. Garden Herb Tabbouleh, Red Rice/Quinoa (cilantro cream sauce), Wild Rice/Farro (cilantro lime cream), Hand Cut Fries (fresh herbs and sea salt), Fingerling Potatoes (fresh herbs and sea salt), Baby Green Beans (shallots and chili flakes), Broccoli (shallots and olive oil), Roasted Seasonal Vegetables, Garlic Mashed Potatoes. Crispy Wonton Shell, Sweet Sesame Soy Sauce, Light Chili Oil. Hearts Of Palm, Roasted Corn, Mango, Avocado, Jicama, Fresno Chilies, Red Bell Peppers, Cucumber, Red Onions, Cilantro, Micro Greens, Yuzu Chili Lime Dressing. Chipotle Aioli, Corn and Jicama Salad, Cilantro, Chili Lime Dressing. Pepperoni, Sausage, Prosciutto, Pancetta, Ham, Bacon, Chicken, Anchovies, Spinach, Mushrooms, Olives, Roasted Peppers, Arugula, Fresno Chilies, Caramelized Onions, Basil, Goat Cheese. Green Lentils, Curry, Olive Oil. Sesame Soy Sauce, Fresno Chilies, Cilantro, Furikake. Marinara, Mozzarella, Almond Pesto, Arugula, Red Onions, Cherry Tomatoes, Parmesan. Beef Short Ribs, Turmeric & Parmesan Cheese Risotto, Green Peas. 7oz Natural Grass-Fed Angus Beef, Rosemary Red Wine Reduction, Swiss Chard Mashed Potatoes, Brussel Leaves. Turmeric Rice, Pomegranate Riatta Sauce. Local Lettuce, Radishes, White Balsamic Vinaigrette. Baby Romaine, Roasted Spiced Walnuts, Watermelon Radish, Lemon Parmesan. Heirloom Tomatoes, Bartlett Pears, Arugula, Balsamic Glaze, Basil, Olive Oil, Sea Salt. Grana Padano Cheese, Chili Flakes. Ricotta Cheese, Butter, Scallions, Hemp Seeds. Slow Braised Chicken Goulash, Apricots, Almonds, Tumeric, Sweet Onions, Ginger, Cinnamon, Basmati Rice, Raita. Swiss Chard, Garlic Mashed Potatoes, Black Garlic Demi Glaze. Cumin, Basil Oil, Bacon Mashed Potatoes, Spinach. Premium Vodka, Fresh Watermelon Juice, Lime Juice, Agave Syrup. Whiskey, Lemon, Ginger, Agave Syrup. Silver Tequila, Muddled Jalapenos & Cucumber, Lime Juice, Agave, Grenadine Sugar Rim. Premium Whiskey, Fresh Ginger, Angostura Bitters, Muddled Lemon, Ginger Ale. Premium Vodka, Fresh Squeezed Ginger, Apple Juice, Lemon Juice, Agave, Sugar Rim. Premium Vodka, Fresh Watermelon Juice, Agave Syrup, Lime Juice. Pineapple And Cinnamon Infused Karma Tequila, Lime Juice, Smoked Salt Rim. Clyde May's Whiskey, Muddled Cherry & Orange, Bitters, Simple Syrup. Muddled Blackberries, Premium Vodka, Lime & Grapefruit Juice, Ginger Beer. Premium Vodka, Malibu Mary Bloody Mary Mix, Splash Of Lime Juice, Celery, Olives. Coconut Chamomile, Long Stem Green, Breakfast, Creamy Earl Grey, Indian Chai. Priced By The Pot. Whether you're hosting an event at your home, having a business meeting at the office, or throwing a lavish wedding party for 200, Ollo is the destination when it comes to delicious food, friendly and efficient service, and creative accommodations to make your vision a complete success. Contact us today for more details and to book Ollo for your next catering event! 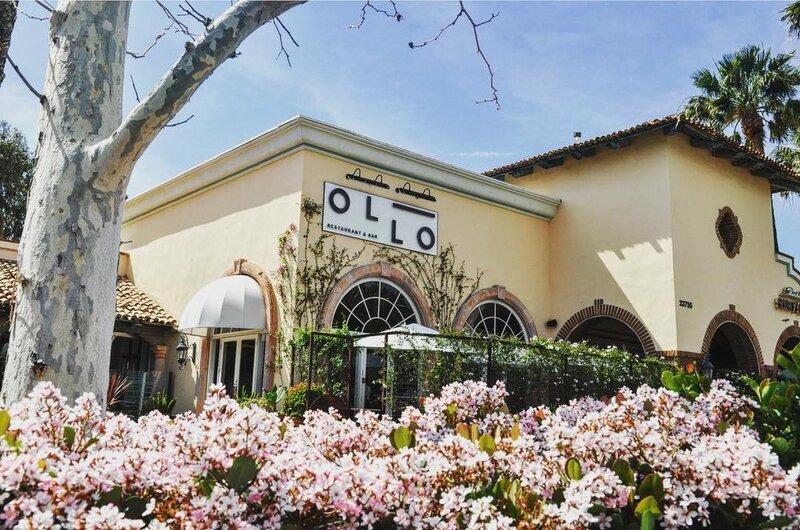 Located in Malibu, OLLO is a family purveyor of locally sourced California cuisine with Mediterranean and Italian influences. We source the best produce and proteins from the following local farms and purveyors: Thorne Family Farm, One Gun Ranch, Niman Ranch, Pitman/Mary's Ranch, Snake River Farm, Hobbs Ranch, Durham Ranch, Groundwork Organic Iced Tea, Charles & Company Tea, and Caffe Luxxe Montenero House Blend Coffee and Espresso. Ollo is now accepting online reservations. If the time slot you are looking for is not available, or for parties of 6 or more, please call the front desk at 310-317-1444. We look forward to seeing you!